Whether you want to use HTML, Word, or Wiki format, the first step is the same: go to the area of the Developer Network where you want to add your content, and click the "Add Content" link. This link is available everywhere except on a specific article. There, you will instead find "translate" and "edit content" links which perform the same kind of function. With our current look and feel, you can find these content entry links near the top right of the browser page. If you are not currently logged in, you'll be prompted to do so. You can also create an account at that time if you don't have one. 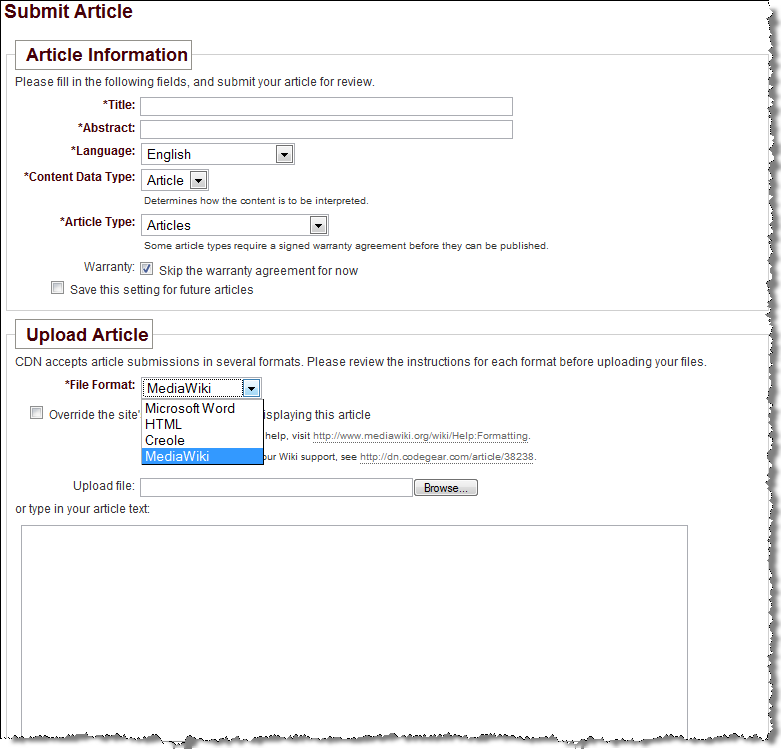 Once you're on the content submission page, enter the Title and Abstract (summary) fields, indicate the language in which you're writing your content, select the Wiki format you want to use, and start typing in the edit box provided. If you prefer, you can upload a wiki document instead. If you want to use HTML, select it and you'll get a browser-based WYSIWYG editor for your HTML, with options to upload your html and attachments. If you want to use MS Word compatible format, select it and you'll be able to upload the complete, rich document. If you prefer using a local text editor instead of the browser to edit your documents, you can edit the document in your preferred text or Wiki editor, then upload it instead. If you want to upload your wiki document instead of using the in-place editor, your wiki document must have a .txt extension in order to be correctly processed. It will only be available for subsequent edits using the in-place editor if a .txt extension is used. The document parser also expects a file with a .txt extension for it to parse correctly. Your Wiki document can be uploaded with all attachments (usually images) in one ZIP file (just like you can do with our support for HTML format). If you're uploading attachments, you must include your wiki .txt document in the ZIP file as well. Your ZIP file can only include one .txt file. Additional .txt files will be ignored. All references to any attachments also contained in your .zip file must be relative, without any additional paths. We have also introduced a special URL pattern on the Developer Network that uses the pattern "/wiki/<title>" to reference other Developer Network articles. Your "internal links" from both MediaWiki and Creole 1.0 are translated into HTML using this article title referencing pattern. Our wiki parsers automatically URL encode the <title> values contained in your wiki document, so you don't need to do that part yourself. 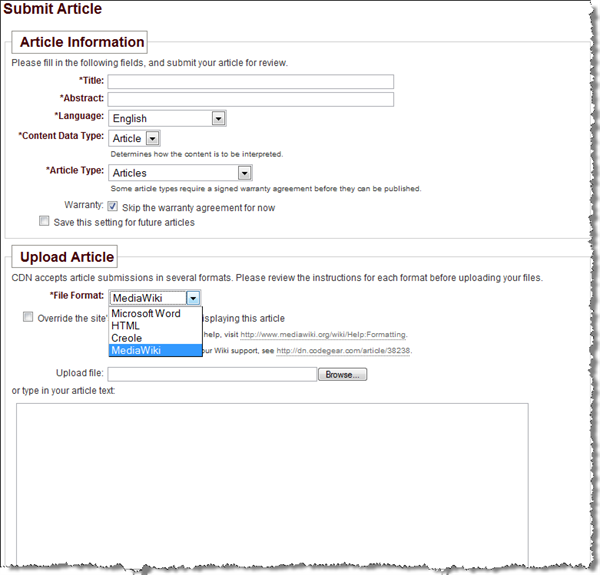 If you have a link in your wiki document to an article whose title cannot be found, three different options are provided to the user to handle the missing article request. Search for "foo" in GetPublished. Because our content management system predates our Wiki support, it is possible that more than one article may have the same title. In this case, the user is provided links to all articles matching the requested title. re: So, how do I access the wiki? You can check a link in the top right corner of the Developer Network page (http://dn.codegear.com/), with an "Add Content". When you try to upload content, you can select the new types. So, how do I access the wiki? so how do I access the content? How do I create it? I have read the article but it doesn't say how to actually use the wiki.